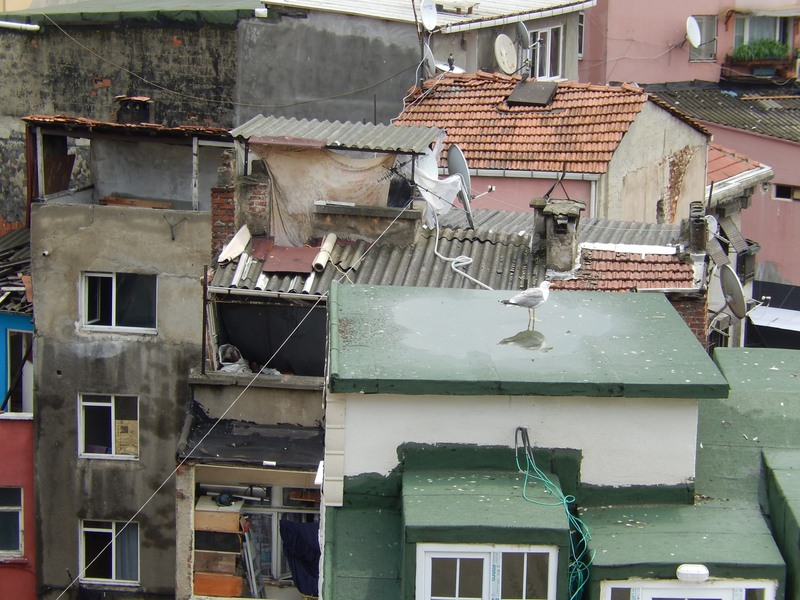 Istanbul is a city of itinerant sea gulls and local alley cats. These two types make up the bulk of its inhabitants, save the humans, who come with a whole different set of problems. The primary problem for the sea gulls and the alley cats is to find a food source. Of course, there is plenty to go around, with one of the main sources being the production of human food waste. Otherwise, there are also rats, lizards, fish, bugs, etc. – all of the dross of nature. However, the assortment of food found in the human trash supply is far more popular than nature’s bounty. After all, human filth is much more variegated. Humans show their generosity in strange ways by leaving so much wealth to plunder in the trash. I once saw a butcher shoe the cat away from its door by tossing a fresh piece of raw meat out into the street for it to chase after. The alley cat of each narrow passage must stake out a claim to their domain of trash and patronage from shop owners. They must defend their region of cobblestone in the night against the other cats. 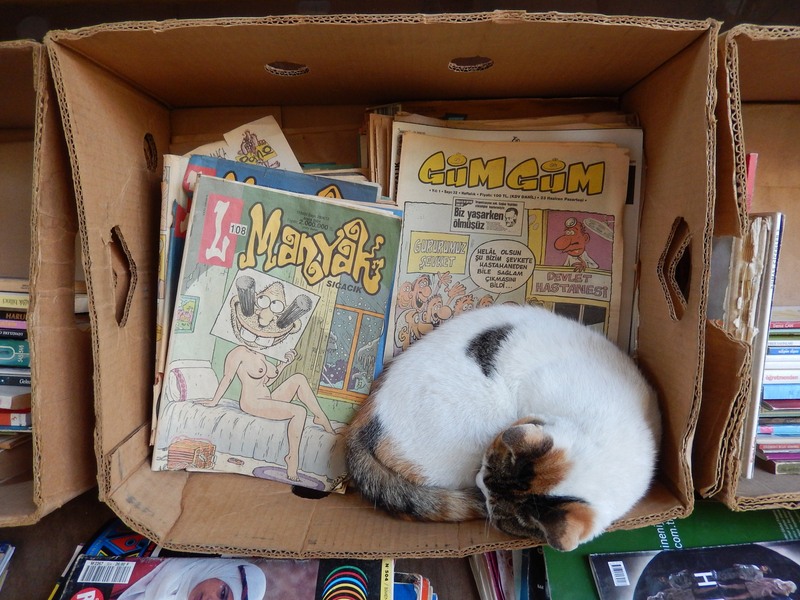 Istanbul is actually owned by cats who seem to adhere to the same principles as the Occupy Movement. They roost in public and non-public spaces alike. In fact, the city is so filled with alley cats that they no longer pander to humans, but fight amongst themselves. The night air is filled with more cats hissing and yowling at one another than it ever is with meowing and purring. In Istanbul, cats are predators and I saw one perched atop the gate to the Swedish embassy the other day, surveying the ground for food, unmoved by the swells of humans that ebbed and flowed underneath its gaze. Not one fine-dining establishment with an open air terrace would ever quarantine itself off from the cats. Humans admiringly laugh and coo at these locals, but the cats are mostly indifferent to such self-indulgent forms of praise. While the humans reach dumbly with naked fingers to touch the rich velvety pelt worn by a cat, the cats themselves are mostly proud of their fangs and their dagger-like claws. The itinerant seagulls are in constant motion here. They swirl through the air making so much racket they outdo the cats with their propensity for noise, if not the humans, too. They soar and drop guano wherever they please. It lands in the lower territories of the cats. They proceed to land on rooftops and balcony ledges, the most prized places of the cats, but they never heed the rewarding heights with any seriousness. They roam from tower to terrace, never quite settling. They are an odd bunch of dissatisfied dreamers that never absorb more than a surface impression of any one place, since they only see with a bird’s eye view. And they are greedy, too. They take what they want and gulp it up with the jutting motion of their necks to hide whatever treasure they can away in their gullets. These birds have no real home and they have no real loyalty to any one place. They just circle through the air giving the impression that they hold an interest, but every place they land is only for a temporary stay. Indecision casts them up against the wind upon any slight disturbance. These whimsical creatures are hated by cats and humans alike. (Meanwhile, an imaginary tourist pretends to think deep thoughts.) Fine, salient sea dust coats the marble balustrades whose flat surfaces are etched with the hieroglyphic traces of seagull talons. From the lobby of the hotel, I walked out to the rail to light a cigarette and visualize solutions to my life’s problems in the face of the vanishing point of the Bosphorus. Naturally, I would come to a point of recognition just when the wind would blow my cigarette out and I’d have to start all over again by relighting, revising, and re-realizing.